The original Jumanji that came out in 1995 was a story of its own kind where a board game came to life. I don’t know about you, but I ignored my mother’s warnings about the film and I watched it anyways as an 8-year-old who had a history of sleeping troubles. When an original film, especially with the main character having been played by Robin Williams, is decided to be remade, I am naturally skeptical, and in this case, fearful. Jumanji just added to my jungle nightmares as a child. However, sometimes, skepticism is surpassed and fear is overcome. 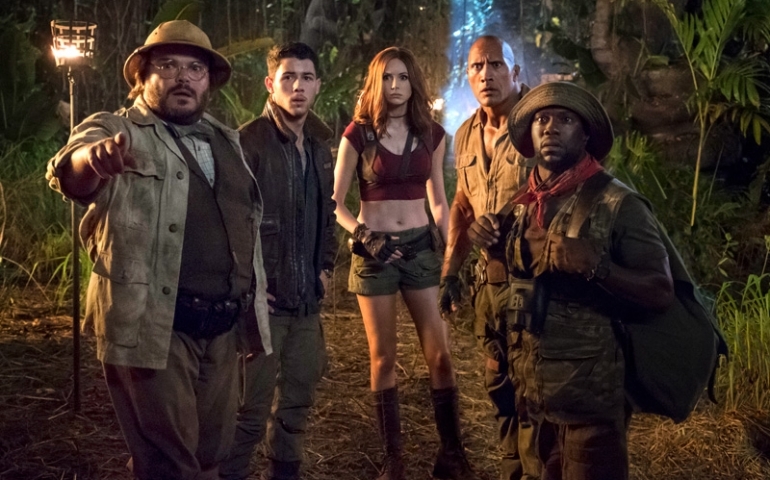 Jumanji: Welcome to the Jungle was released into theaters December 20, 2017, and according to Rotten Tomatoes it is leading the box office in ticket sales. The general audience score is 4.5 out of 5 stars and Rotten Tomatoes gives the film an average 6.1 out of 10.
nerd with a struggle with words in the presence of females; Fridge, the biggest jock on the block who neglects homework and his childhood friendship to Spencer; Bethany, a selfie-obsessed barbie girl who’s insta followers consume her everyday life; and lastly Martha, the shy, sassy, and smart ginger who would rather keep to herself and whom Spencer (*spoiler alert) has a massive crush on. In the basement of their school, with no cell phone service, they discover a tv and a vintage video game. That’s right. Jumanji got an upgrade. To start the game each had to choose an adventure character. Lights flash and everything goes nuts. Before they know it they’re in the jungle facing their fears, alternative skills, physique, and personalities. Played by Dwayne “The Rock” Johnson, Kevin Hart, Jack Black, and Karen Gillan, the four adventurers set out to win a game with only three lives to spare. On their quest, they stumble upon Nick Jonas’ character, Alex, who has been trapped in the game for nearly 30 years. Will they conquer the game and return home to reality alive? Find out in the comedic, less nightmarish, more family-friendly, and creatively inspired Jumanji: Welcome to the Jungle.